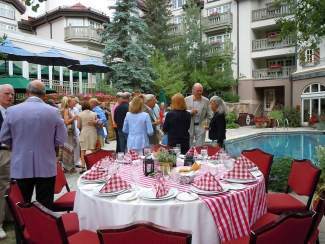 VAIL — Sonnenalp’s “Gather in the Garden” series begins again on Wednesday. A white linen garden party complete with a three-course meal, creekside views and wine pairings from select vineyards, “Gather in the Garden” is one of the most anticipated events at the Sonnenalp for the summer. The event is co-hosted by Sonnenalp head sommelier Jarrett Quint and his special guest, founder and winemaker Carroll Kemp, of Red Car Wine Company. Kemp will pair his award-winning Sonoma Coast Pinot Noir, Chardonnay and Rose with a dinner focused on light and fresh summer selections. Red Car Wine was founded by winemaker Carroll Kemp and partners Mark Estrin and Richard Crowell in 2000 with 50 cases of wine from a single ton of grapes. The winery name is a tribute to the electric trolley cars that ran throughout Los Angeles from the late 19th century through the early 1960s. These evocative “red cars” provided transportation in a romanticized time and place. The boutique winery is focused on producing Pinot Noir, Chardonnay and Syrah from a network of cold-climate vineyards located in the West Sonoma Coast. The wines are made in small lots, using minimalist intervention techniques such as native yeast fermentation, gravity flow and natural acid. Each winegrowing decision emphasizes crafting aromatic wines of complexity, finesse and balance. The three-course family-style dinner menu includes passed appetizers paired with a sparkling wine; Colorado trout with fresh garden salad topped with a spring onion vinaigrette and paired with Red Car Sonoma Coast Chardonnay ’11; herb crusted rack of lamb served with rustic ratatouille and pan-fried gnocchi paired with Red Car Sonoma Coast Pinot Noir ’11; and a lavender parfait with caramelized peach and strawberry creme brulee paired with Red Car Sonoma Coast Rose of Pinot Noir ’12. “Gather in the Garden” begins at 6 p.m. on Wednesday and is $39 per person for three courses and $58 per person with the wine pairing. Tax and gratuity are additional. Reservations are required and can be made by calling 970-479-5429. Gather in the Garden dinners will continue throughout the summer in July and August. For more information, visit http://www.sonnenalp.com.